The fresh start of a new year can be invigorating. It’s a great time to tap into the collective momentum and take initiative in your life. 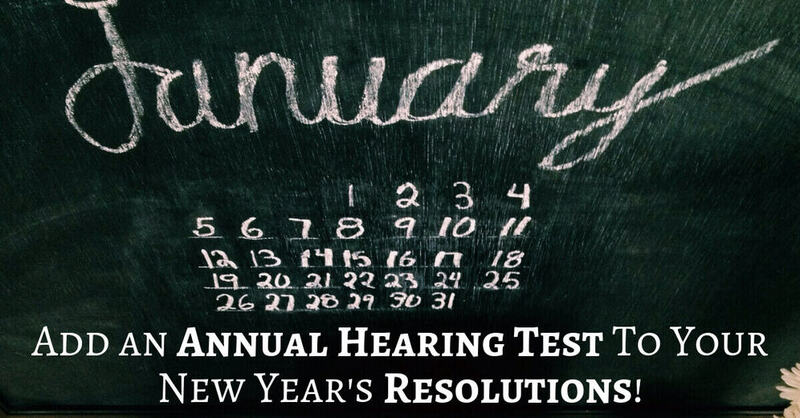 In addition to your other resolutions this year, you might want to schedule a hearing test for yourself, particularly if self-care is one of your 2019 priorities. Hearing loss affects a huge number of Americans, sometimes without their knowledge. There are many rewards for early diagnosis and treatment of hearing loss, but read on if you need some convincing! More than 48 million Americans report some degree of hearing loss, yet it remains relatively unnoticed. You might be surprised to find out that it’s consistently ranked among the top public health concerns in the United States. Because of the aging baby boomer population, hearing loss will continue to impact the lives of more and more Americans, since hearing loss is often correlated with the natural process of aging. Age related hearing loss is one of the more pervasive forms of hearing loss. It often happens gradually, so it is particularly difficult to self-diagnose. And the symptoms show up differently than you might expect. Instead of an overall lowering of volume, hearing loss first presents as a loss in the highest and lowest frequencies of sound. This makes conversation challenging — it might seem as though people are always mumbling around you and you often ask for a comment or question to be repeated. Instead of letting this problem go to the point of no return, it’s best to get an early diagnosis. There are a few benefits to opting for hearing aids early on with age-related hearing loss. For one, it’s a degenerative disease that only worsens after time. Thankfully, studies suggest that treating hearing loss with hearing aids actually slows the progression of hearing loss. Another reason to intervene early is because of the role that the brain plays in hearing loss. While our ears are the receivers of sound, our brains do the processing. The auditory nerve transmits sound information from the ears to the brain. When sound information is incomplete due to hearing loss, the brain receives less information via the auditory nerve. It’s a use it or lose it scenario. As the entire hearing system isn’t able to function as before, we begin to lose the ability to regain full hearing. Even with hearing aids, hearing will never be restored to its previous state. However, with early intervention and less hearing loss at the time of treatment, you’ll experience less transition time and a better range of hearing overall. People with hearing loss tend to wait an average of ten years before treating hearing loss! In that time, a sense of isolation can set in since communication becomes increasingly difficult. Human beings are social animals and connection is one of our primary drives. Hearing loss makes communication extremely difficult, and it can severely damage important relationships in our lives. In addition to depression, hearing loss can increase fatigue, stress and other emotional and mental health issues. Remember when we talked about the ways that the brain is involved in hearing? It is because of this that hearing loss might also increases your risk of dementia. As less and less sound information is received, the brain takes notice. Because of a wonderful phenomenon called neuroplasticity, our brains are able to reorganize themselves throughout the span of our lives. This means tremendous things, like learning new skills at an advanced age and being able to transform our mental processes all through our lives. However, experts believe that it is also the reason that dementia and hearing loss are linked. Because the brain notices that we’re not using our hearing system the way we used to, it might reorganize itself, causing disruptions in other areas of our brain, like the one that houses memory. Just like a trip to the dentist or the eye doctor, make a hearing test with a hearing health specialist an annual thing. Prevent health issues from becoming issues in the first place, and call us today at Advanced Tech Hearing Aid Centers to take control of your hearing health.